Actor Tarun appeared before the Special Investigation Team (SIT) probing the Hyderabad drug racket on Saturday, officials said. 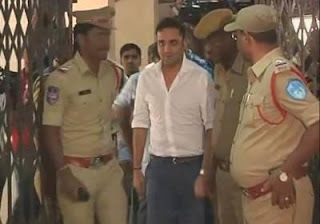 Tarun, one of the 12 celebrities to be served notice by SIT, has already denied taking drugs or having links with the accused arrested in the case. The actor, famous for "Nuvve Kavali" (2000), had opened a pub in 2009 in Banjara Hills area of Hyderabad. As the role of pubs in drug peddling came under scanner in the past, he had sold his stakes. The investigating officials had interrogated actor Subbaraju for 13 hours on Friday. The actor, known for his negative roles in many films, provided leads to SIT for further investigations. Subbaraju reportedly revealed names of 10 film personalities. SIT had questioned director Puri Jagannadh on Wednesday and cinematographer Shyam K. Naidu on Thursday. The celebrities were summoned for questioning as their contact numbers were found in the call data of Calvin Mascrenhas, the kingpin of the racket. Actors Ravi Teja, Navdeep, and Nandu, actresses Charmee Kaur, Mumaith Khan and art director Chinna are among the other celebrities who will be questioned next week.